This Vietnam house extension cantilevers off the edge of a stone plinth, protecting the rooms inside from annual flooding (+ slideshow). 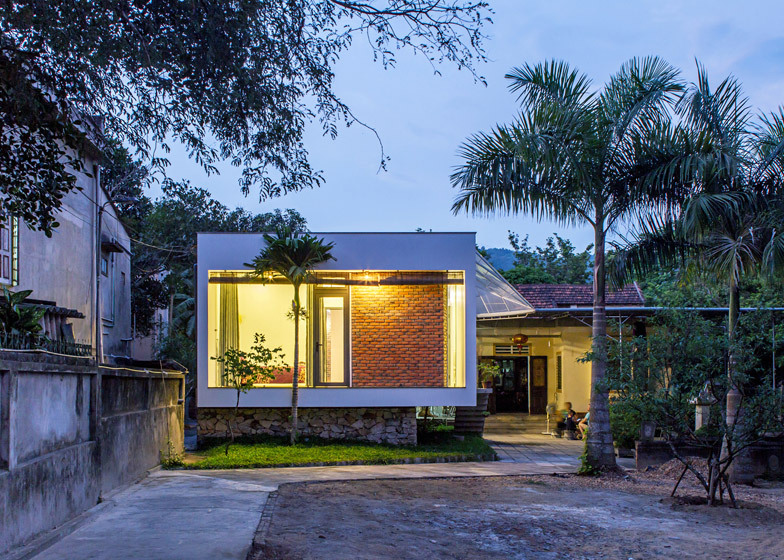 Designed by local studio Nha4 Architects for a retired couple and their son, The Shelter extends an existing residence in Thái Hòa – a town in Vietnam's Nghệ An Province where annual flood levels can reach up to 150 centimetres. The 70-square-metre extension is adjacent to, but detached from, the family's main home. It is raised above the ground to provide them with a separate living room, two bedrooms, a bathroom and a prayer room when waters rise. 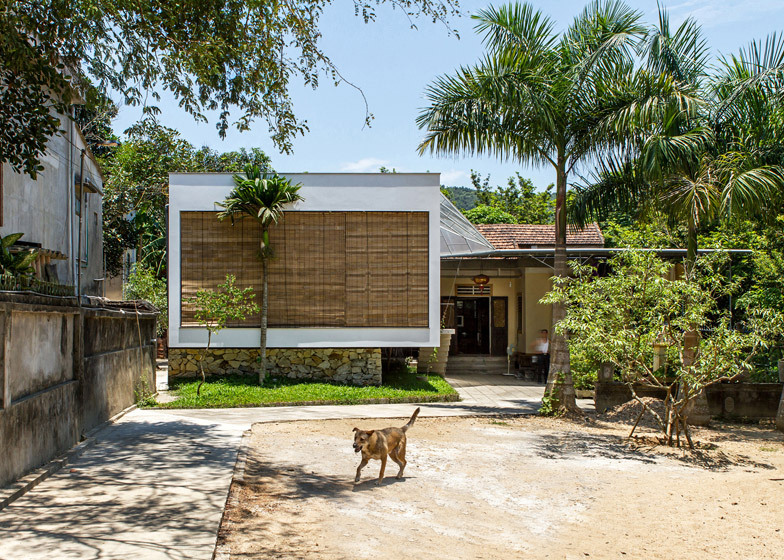 "The existing house is without any protection," architect Nguyen Khac Phuoc told Dezeen. "In the past, the family had to live temporarily in a neighbourhood shelter when it flooded, so we raised this new building 150 centimetres above the ground." 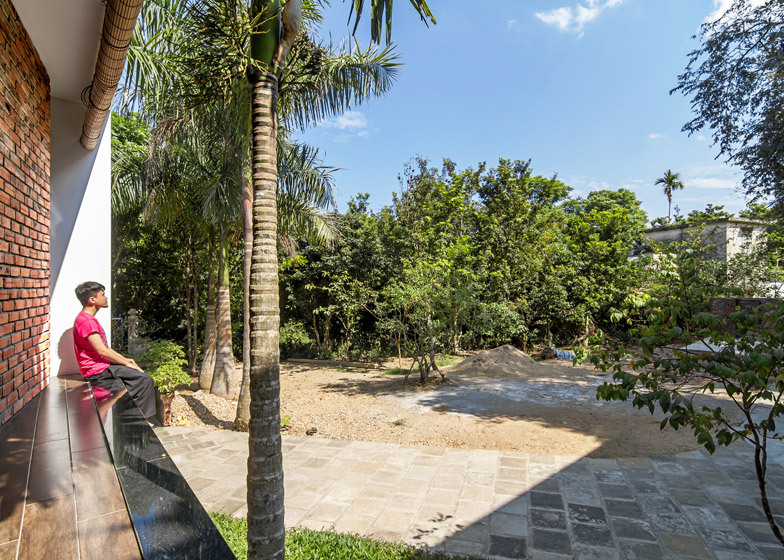 Vo Trong Nghia's latest low-cost house is "stable enough to withstand natural disasters"
The rectilinear structure replaces a more traditional building of the same size on the site, which was previously occupied by the grandparents. Voids are cut into the front and side to provide small balconies. 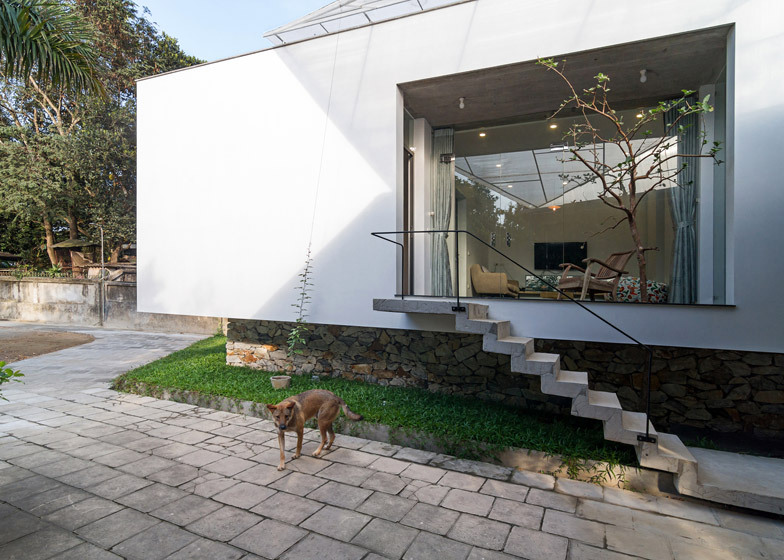 There is also a cantilevered concrete staircase on one facade that leads to a small patio, intended as a shaded buffer zone between the garden and the living room. The patio has a hole cut through the floor to accommodate an existing tree on the site. Inside, the extension has a slot window in the living room set at a low level to avoid harsh light and heat from the sun, and a curved corridor that leads to the bathroom and one of the bedrooms. Ironwood flooring was added in a bid to make the interior feel cooler in summer and warmer in winter, and a bamboo screen was installed across the front facade, which can be drawn to provide privacy and shade. These techniques are common for houses in the country to suit the tropical climate. 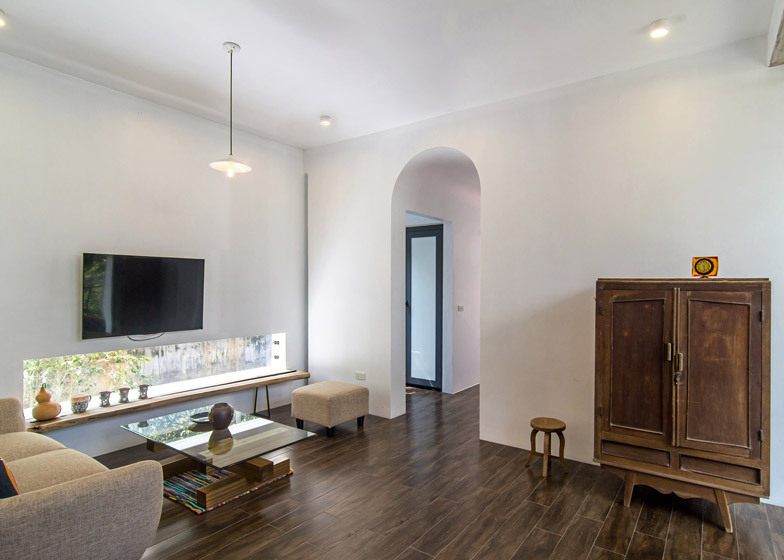 Other examples include a guesthouse clad in colourful shutters to provide ventilation and shade, and a renovated house with pivoting glass doors along the living space. A separate entrance to the rear of the extension provides a more direct route to the existing house and kitchen at the back. Construction for the extension was completed in three months, with stone used for the plinth, concrete for the main structure, and brick for some of the exterior walls. "We chose these materials because they are locally available and widely used in the area," said Nguyen. "Limited budgets, local materials, and the context of a flood-prone environment informed the design." Photography is by Hoàng Lê.